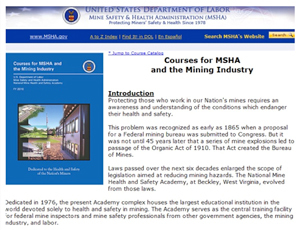 Since 2009, CSS has provided the Mine Safety & Health Administration (MSHA) with full-time instructional systems design services to develop web-based mine safety and health training programs and to support classroom presentations. CSS designs new web-based courses based on current instructor-led classes and needs. We develop SCORM conformant, Section 508 accessible content in the Lectora Content Management System and deploy the training online in the CourseMill Learning Management System (LMS). We provide full service training solutions including analysis, design, development, implementation, and evaluation. Content areas we have designed and deployed include Fire Protection, Respirable Dust, Personal Protective Equipment (PPE), Hazard Communications, Accident Investigation, Special Investigations, Hoisting (Coal & Metal/Non-Metal Mining), Tunnel Boring Machines, Shaft and Slope Sinking, and Electrical Permissibility (Coal & Metal/Non-Metal Mining).